The view from the workshop door - one of my favourite views. West Dean College has got be one of the best places to teach in the U.K. The grounds are beautiful, the gardens are varied and colourful, the teaching areas are excellent and the food is - just fabulous! 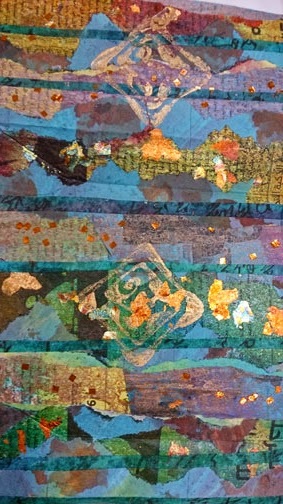 East Sussex Embroiderers Guild hold their Summer School there every year. I was lucky to be asked to teach this year. Sophie Long was the other tutor. Her goldwork is very modern while still being traditional. 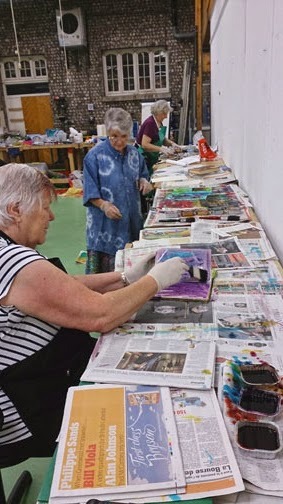 We had great fun - we were a small group of six - I think I have taught all the other member of the Guild in this area of the country over the past ten years. 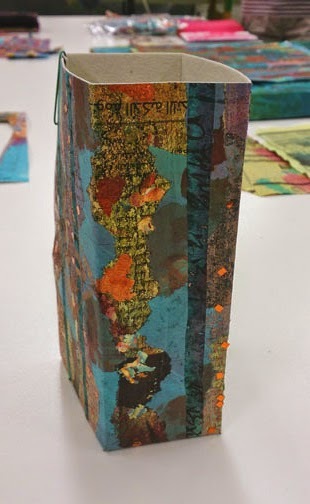 I had been asked for a three dimensional slant on my newspaper based workshop - A New Starting Point. So I took my die cutting machine along to cut the boxes and brooch blanks. Some of the group painting up their papers and old books. The group brought in a great selection of foreign language newspapers, old atlases, technical and childrens books. We coloured these with a very dilute solution of procion dyepowder and water. No fix is needed as the paper is not going to be washed. 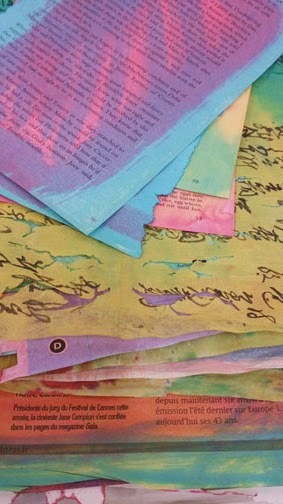 Layers of dry and colourwashed papers ready to use for layering. We also painted up Bondaweb ready to layer up with all the papers. 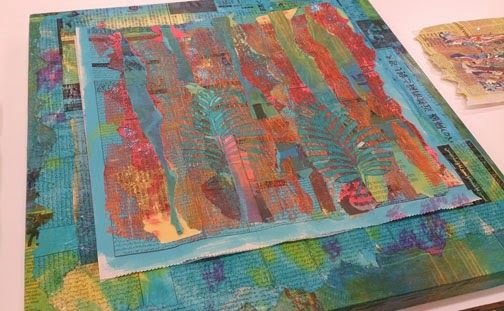 This is just painted Bondaweb ironed onto turquoise colourwashed newspaper, it look good enough to stitch already . . . .
Caroline layered up her papers and then printed onto them. The print was then stitched around in a toning colour thread. 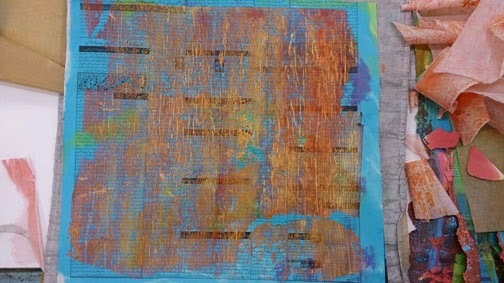 A stretched canvas was covered with toning newspaper to create a mount for the stitched layers. Caroline didn't want to rush the stitch to finish the work before we left - she is going to send me an image when it is finished - I hope!!! You can get the idea of what she was trying to achieve. 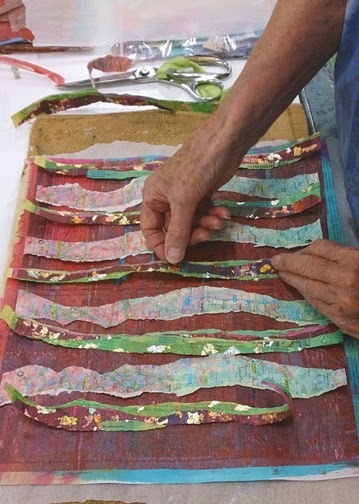 Layering decorated strips of newspaper with painted Bondaweb and gilding flake. Laying down strips of road atlas alongside strips of decorated newspaper. A subtle fish block print ready to stitch. 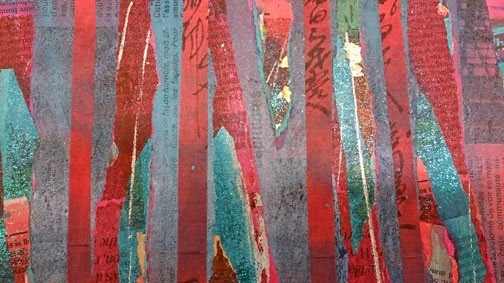 A combination of newspapers and transfer foil. 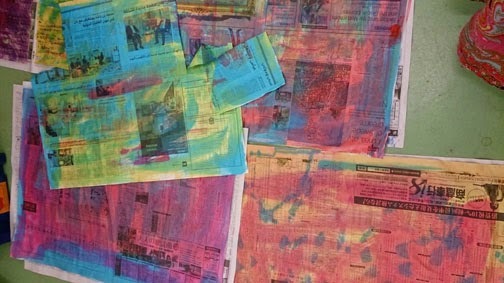 More prints on the layered newspapers. There were many brooch blanks cut - here are just a few . 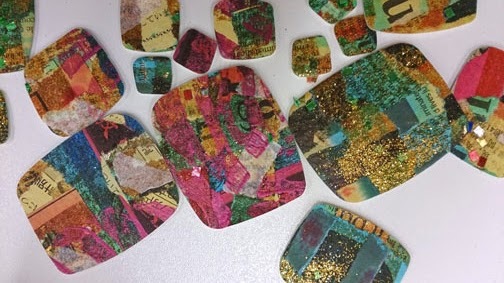 . . to achieve a firm background for the brooches - the layered papers were ironed onto S133 - the stiffest iron-on interfacing then cut with my Big Shot Pro die cutting machine. This joyful colour combination of newspaper, old books, gilding flake and print eventually became a box - after the layers were ironed onto Decovil 1 - the new leather feel iron-on interfacing. The finished box. Just gorgeous! We had a great time at West Dean - a few glasses of wine were drunk and one or two excellent puddings were eaten. Well it would be very rude not to. 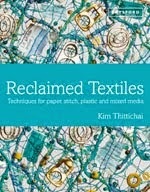 Reclaimed Textiles - paper, print and free machine embroidery. The course is running but there is room for a couple more if you fancy a treat. 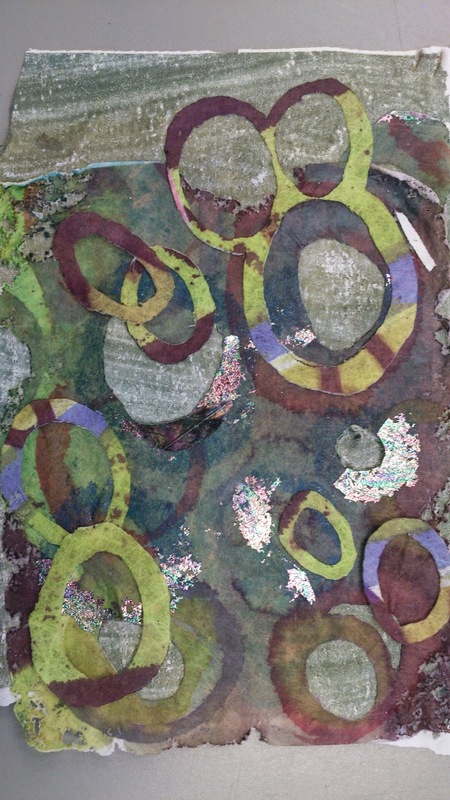 This sample was made by Veronica Wells and is featured in my book Reclaimed Textiles. We will be working along these lines, using free machine embroidery to raise the surface of the printed papers. I am now teaching again locally in Brighton at The Bridge - my courses can be found here - www.thebridgebrighton.com There are still spaces on my course A New Starting Point which is similar to the one featured on this post. It is a weekend workshop - July 5th and 6th. 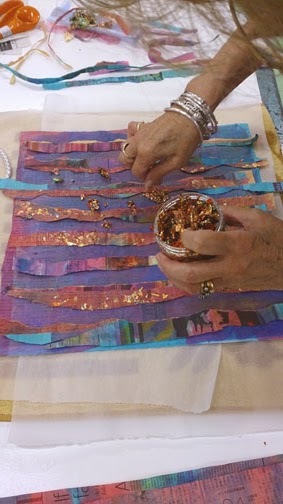 I have booked an extra course today - September 6th and 7th (Saturday and Sunday) - Hot Textiles. I haven't taught this for a while and students new to heat distressing may find this workshop useful. 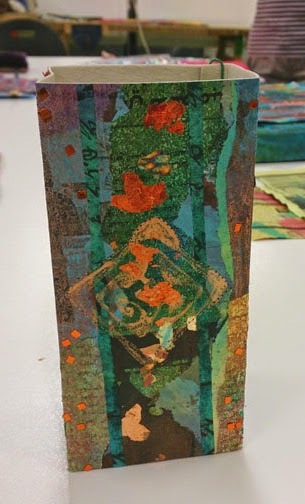 Layers of transfer print and transfer foil by Tracey Knight. I am now counting down to the beginning of my Experimental Textiles course at The Old Needle Works in Redditch which starts again next week and finishes next March. I have this weekend off - whoo hoo!!! I am spending it with my sister at her house. A great time will be had. I don't spend enough time with her. The two Valeries getting stuck in to their 'Journeys'. The life of a freelance tutor can be fun, exciting, tiring and a bit of worry as far as earning a living is concerned - but sometimes a course and a teaching venue come together to create such an amazing energy that all worries are forgotten. The venue was Art Van Go - I love teaching there, it is always good to see Viv and Kevin and their team are always helpful - nothing is too much trouble. 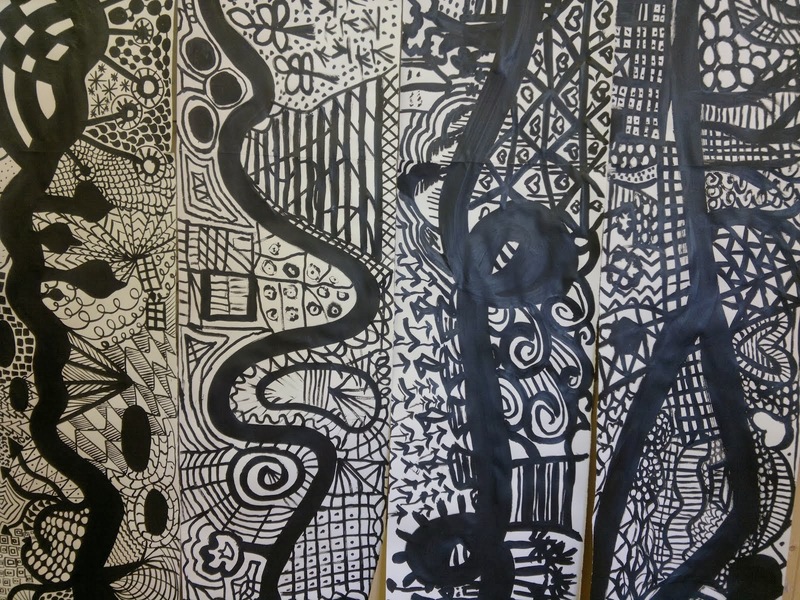 The course was Creating Original Designs. We had seven in the class, enough to have fun as a group but small enough for me to be able to work with each student individually. 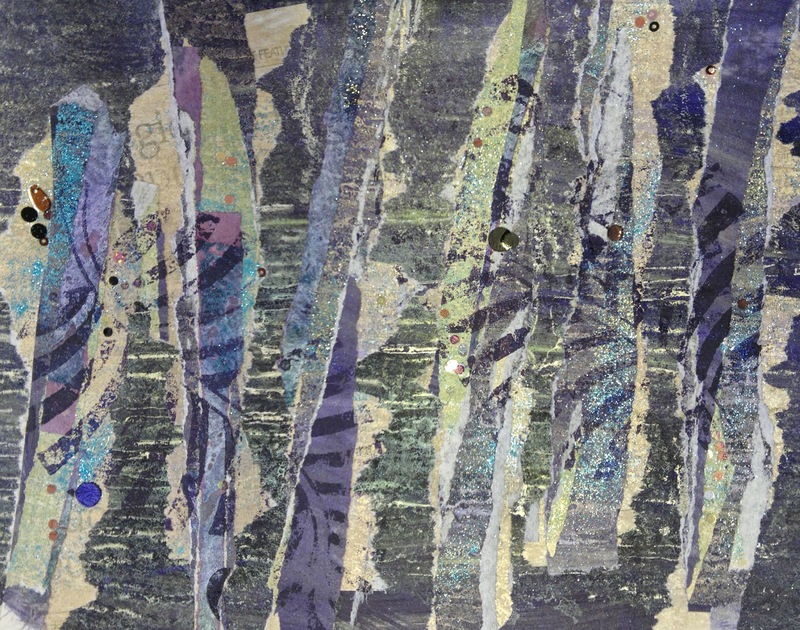 Creating Original Designs is a course I have developed over the last twenty years while I was teaching my four year version of Experimental Textiles. Lynda painting her Journey . . . 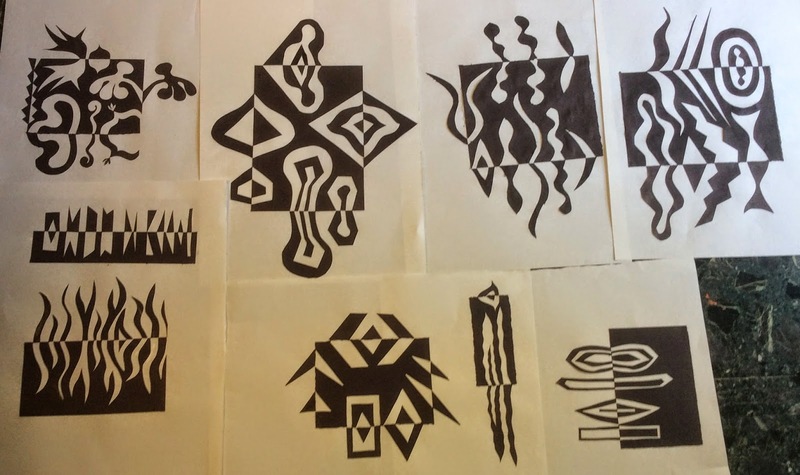 I use three design exercises, The Journey which is my own, and an expanding and and a flipping out exercise that come from a book my tutor gave me when she retired. I use the same three exercises every single time I teach this course, and each time you get totally different results. I like to show how very simple creating designs can be. The seven Journeys laying side by side on the floor. As colour hasn't been introduced, they all merge into one. The expanding exercise is a great one for looking at 'spaces in between'. 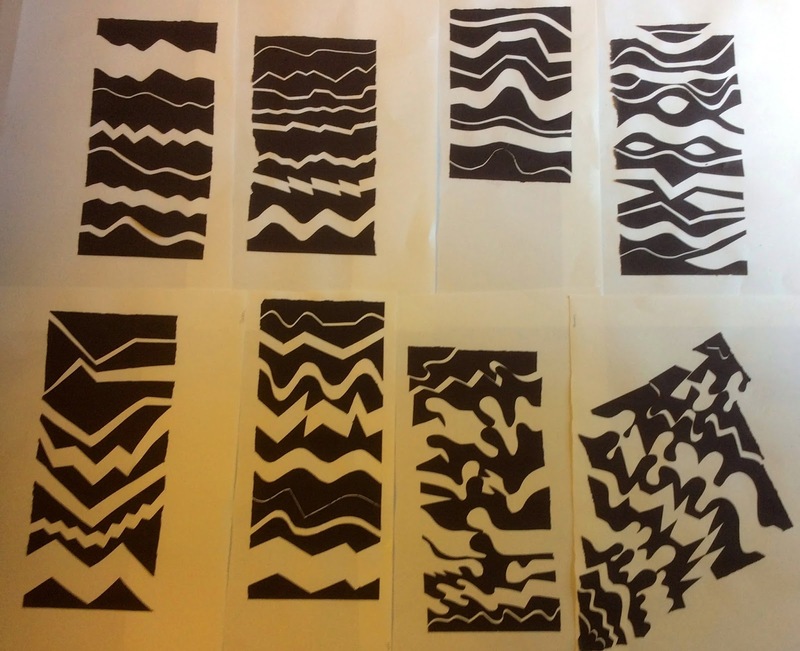 . . . .
. . and the 'flipping out' exercise - all interesting designs in themselves, but also great to take sections from. Jill working on her 'flipping out' exercise. 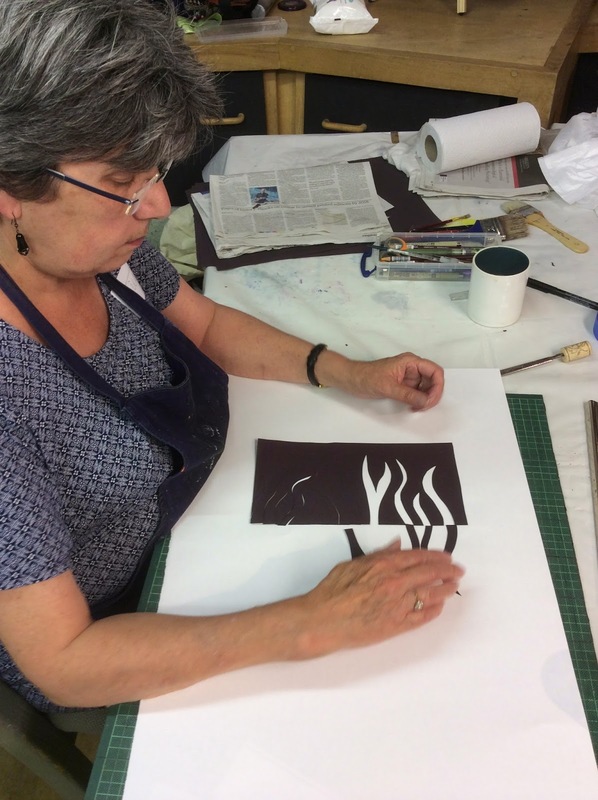 Sharon taking a section from her Journey that will become a fabulous printing block. 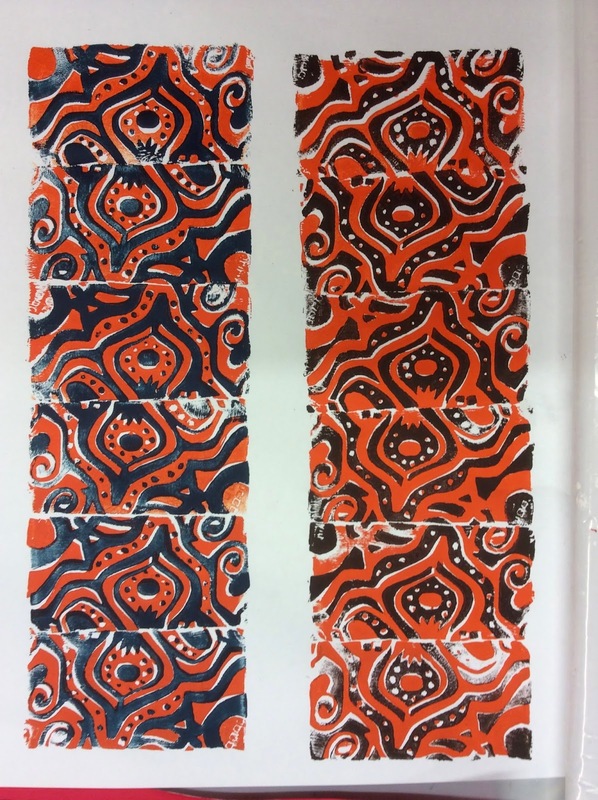 The 'positive' and 'negative' blocks from the above design have been overprinted. Then colour washed with yellow procion colour wash.
Little Valerie transferring her designs into her sketchbook and experimenting with colours. Tricia working on her two colour designs. 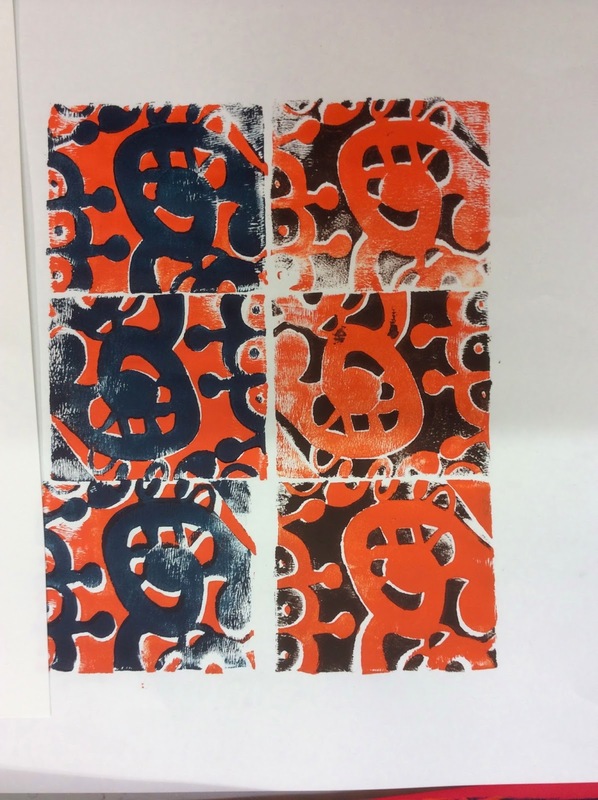 The positive and negative printing blocks taken from Tricia's design. 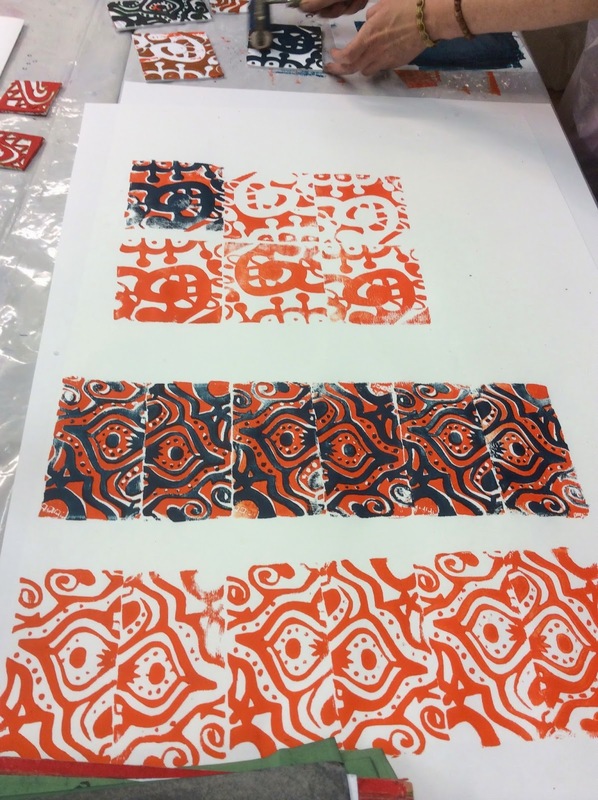 Tricia's sample page of over printing with both of her blocks. 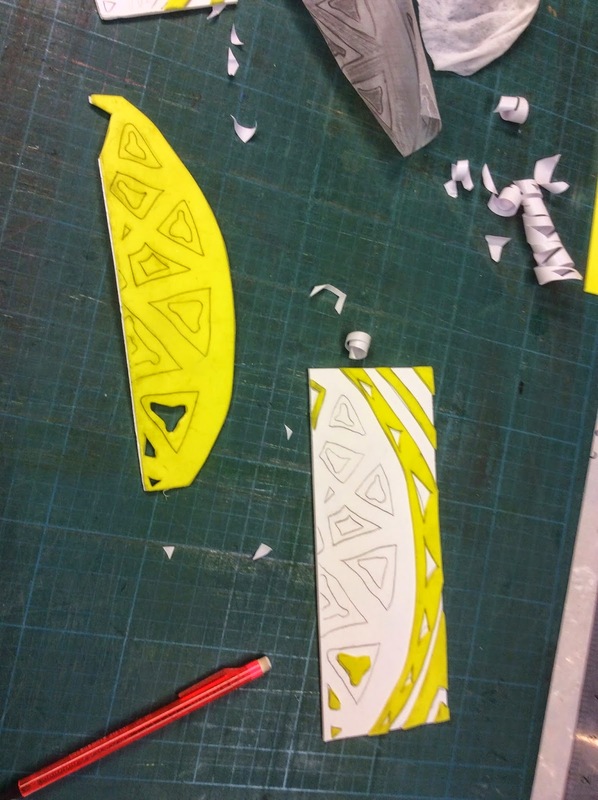 We used self adhesive foam and foam core board to make the printing blocks. Lynda's over printing, the bottom one has been colour washed with red procion. Hannah very intently measuring the foam core for her blocks. Jill over printing her stunning block. . . Different colour combinations of the same block. Hannah printing with her first blocks. Then starting to over print. The finished over printing. 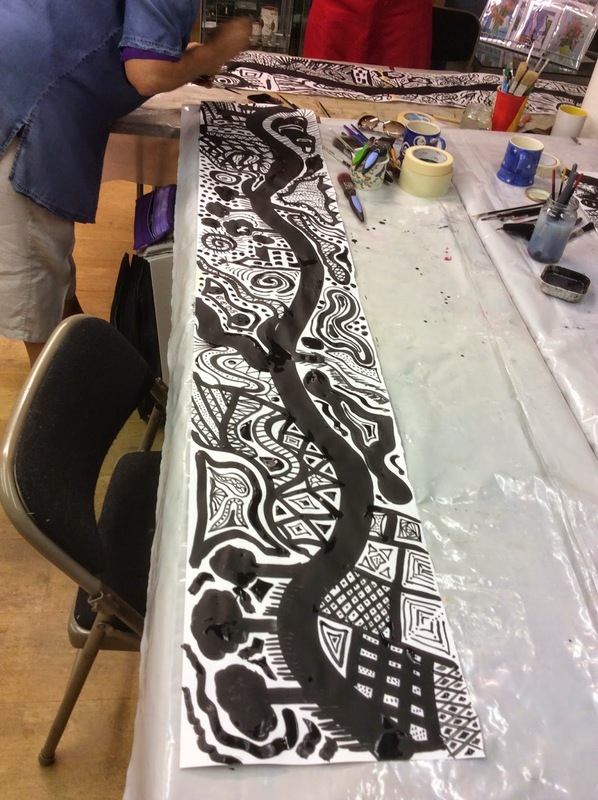 This design was taken from Hannah's Journey.
. . . as was this one. 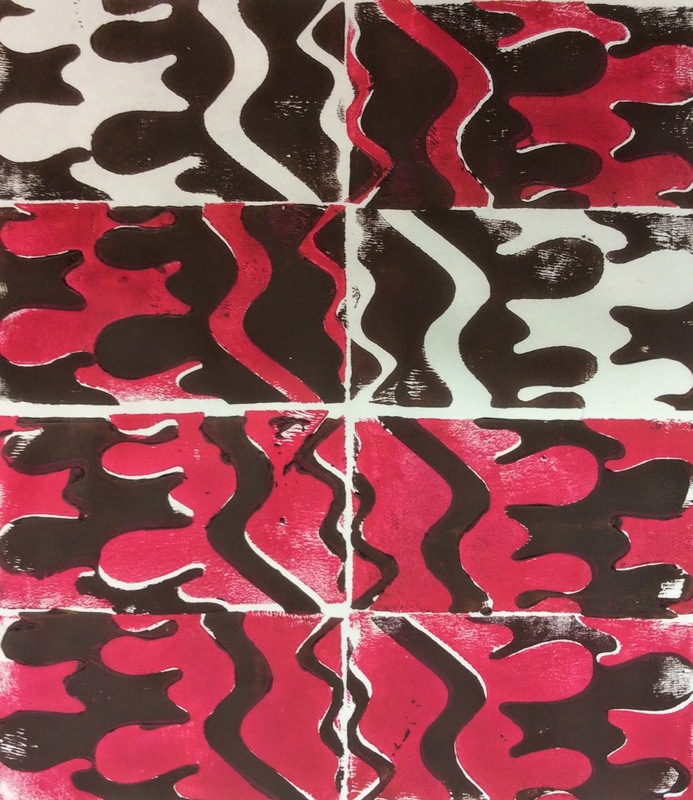 Another one of Hannah's over prints.This design was taken from her 'expanded' exercise. Val's over prints - just fabulous. A table full of gorgeousness . 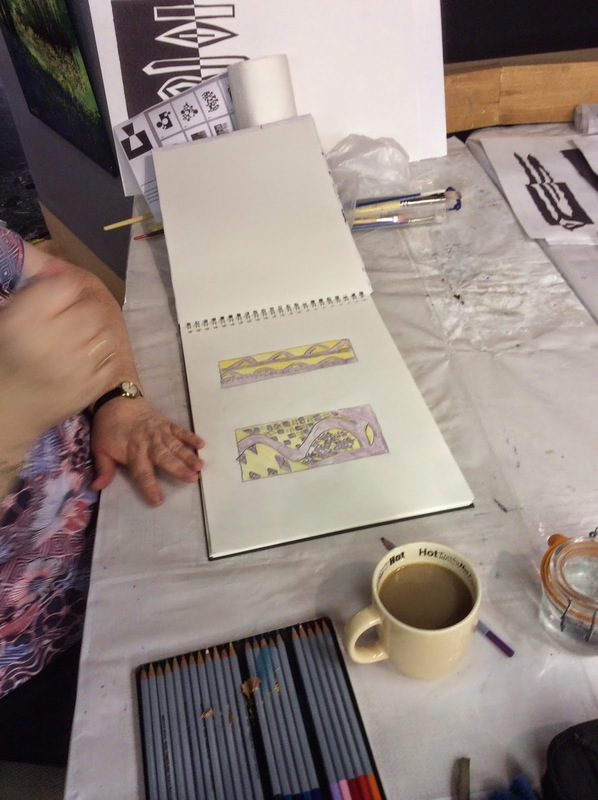 . .
Lynda got so carried away, she made mirror image blocks so she could 'flip' and 'mirror' her prints. I hope this all makes sense? I have tried to make the process clear. It is amazing what can be achieved in just two days. 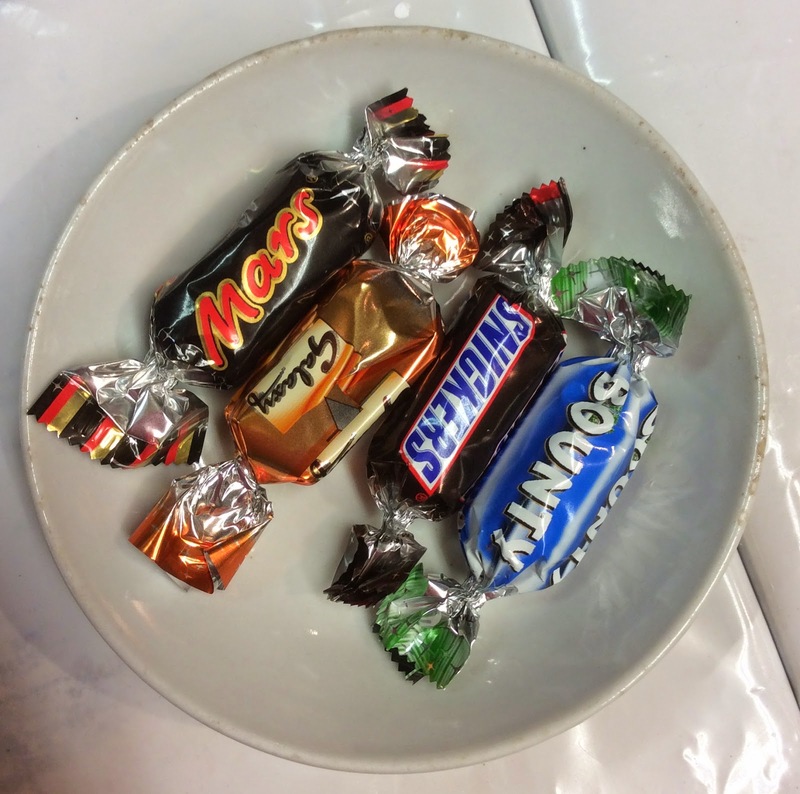 There are chocolates served every day at three o'clock - it's tough, but some how we manage to eat them . . . 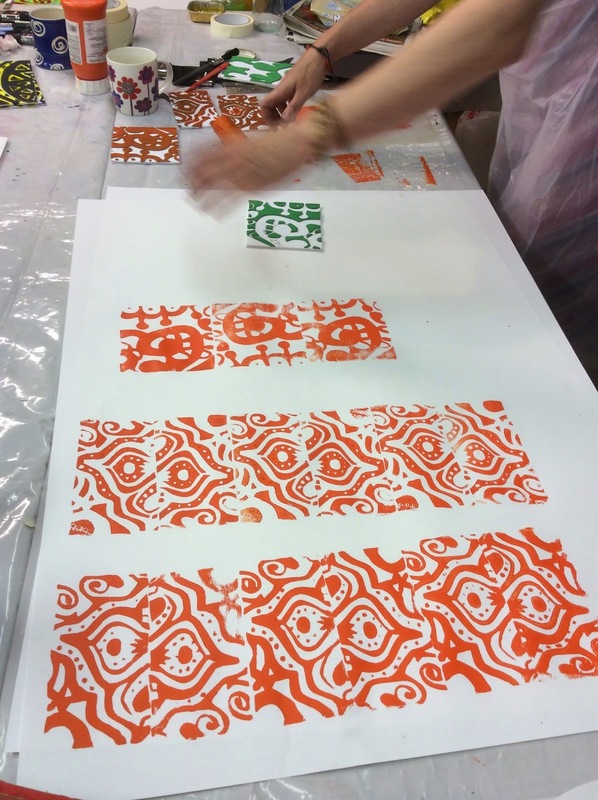 The next Creating Original Designs workshop will be at Art Van Go on the 9th and 10th of June 2015. 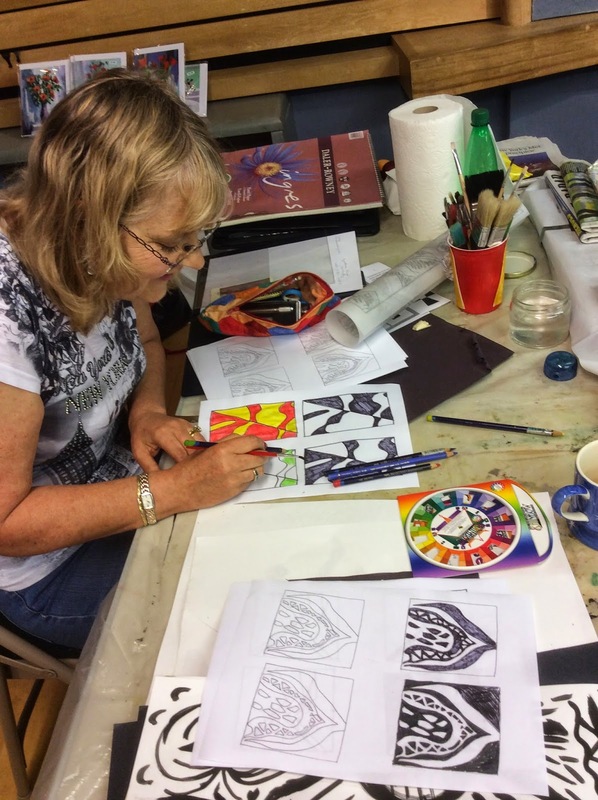 This kind of basic course is suitable for any kind of artist or craftsperson, from stained glass and ceramics to textiles and stitch. My next workshop at Art Van Go is the 2nd - 4th of September. 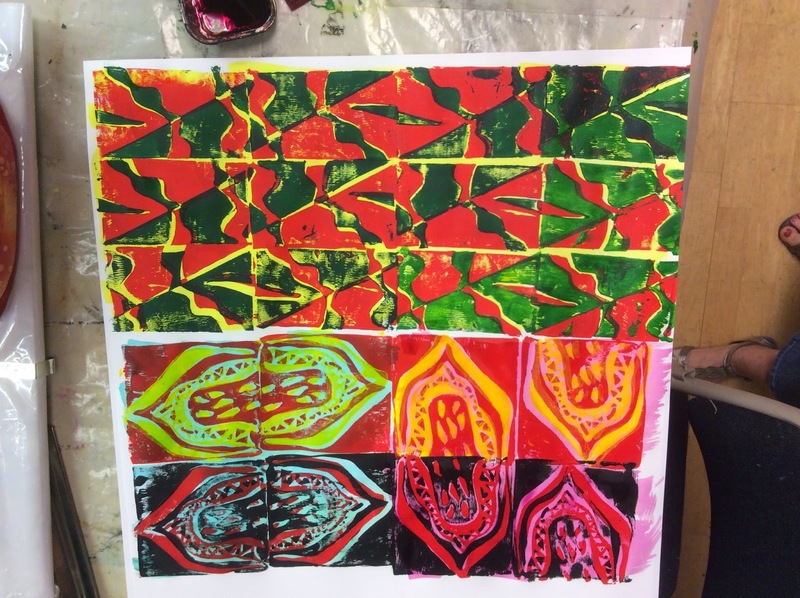 Transforming Transfer - working with disperse dyes (transfer paints) and synthetic fabrics. Working up designs that we can use for applique and can also be layered up and heat gunned - Yeehaa!!! I am off to West Dean College today to teach a weekend workshop for the East Sussex Embroiderers Guild. The gardens will be glorious now - I will make sure I take lots of photos - both of the work and the beautiful grounds. The workshop is A New Starting Point which is newspaper based and we are looking at making making boxes and maybe book covers. What a fabulous way to spend a weekend. New courses, upadated website and just . . . Stuff!!! This is a catch up - kind of housekeeping notes. I have added two workshops in Brighton to my diary. I have found somewhere new to teach locally with plenty of parking and not too far from Falmer station. Discovering and developing the redemptive qualities of old newspapers. 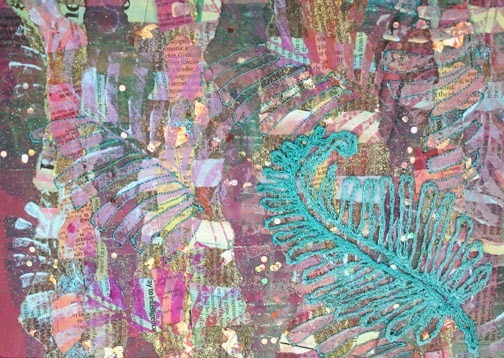 Create fascinating surfaces on which to print and stitch. 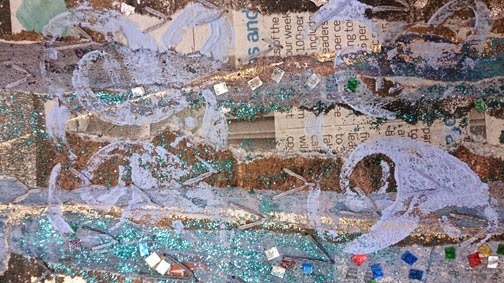 Using painted Bondaweb and gilding flake we will explore the possibilities of layering textures to end up with firm pieces of work that can be used to make boxes and vessels and demonstrate the striking contrasts of the media. Rich/poor and matt/shiny. 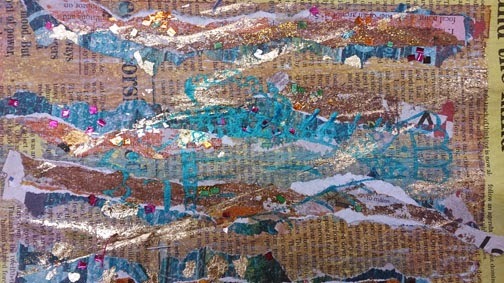 Layers of heavy Tyvek layered with polyester organza, stitched and then zapped with a heat gun. 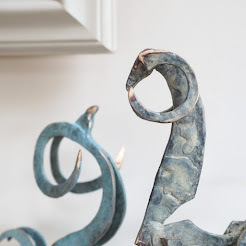 Enjoy and explore all the techniques for surface decoration you have wanted to try but haven't yet found time. 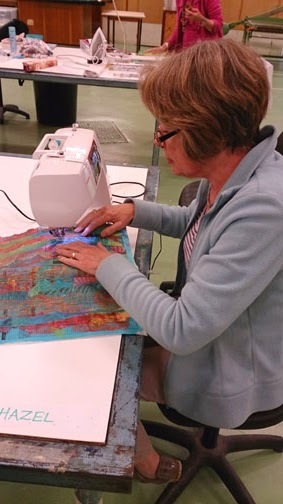 Create wonderful surfaces to stitch or not! 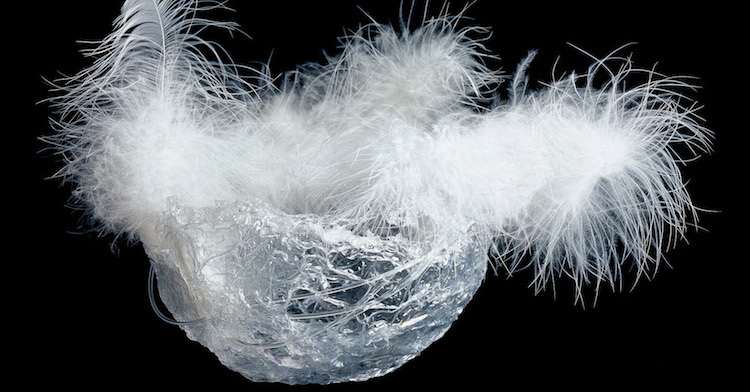 Products include painted Bondaweb, 'Tyvek', Vilene Spunbond, embossing powders and much more! The Hots Spots are flying out at the moment, it seems that a lot of you are realising just how useful they are now, and the KK-glue is selling well - which is good as it was a big investment. The new Sparkle and Shine Play Pack is also proving very popular. I think the promotion I carried out on Facebook helped. Many thanks to those of you who took part. All the new videos are now on the website on the appropriate pages, this should help you understand how to use (or how I use) the products. 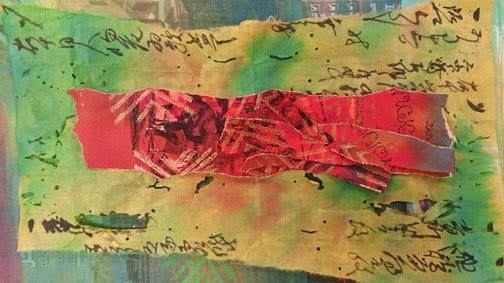 Torn paper exercise - Rachel hadn't picked up a needle before she started the course, she is now and avid stitcher - Yeehhaaa!!! 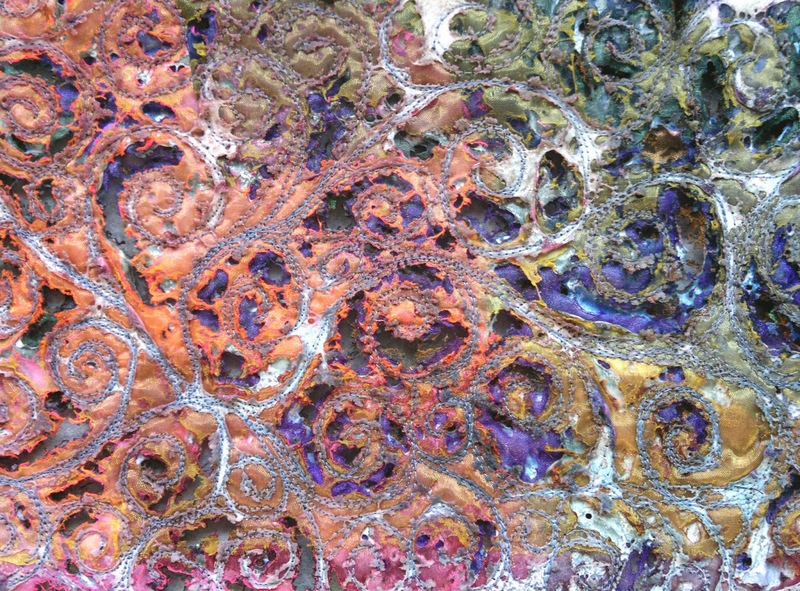 I am very excited about Experimental Textiles running again this year. This will be the third year of teaching this course at IDC, The Old Needle Works in Redditch and it is what I do best - guiding students through all the basic textile techniques so they can confidently work on their own. One of last years students enjoyed the course so much - she is doing it again - and we have a very keen Tricia flying in from Scotland for every session. Here are a couple of endorsements from two of the students that finished the course in March. "I was looking for a well thought out course that covered a wide variety of techniques taught in a way that gave the freedom to experiment without the constraints usually imposed by an accredited course and actively encouraged individual thought. Kim's Experimental Textiles did all that and more! 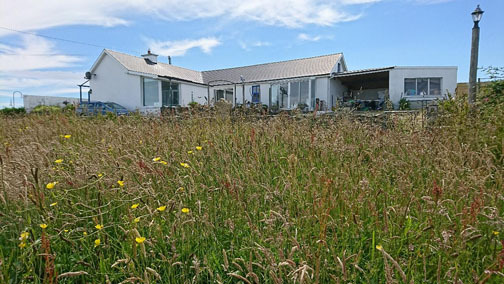 The Old Needle Works/Inkberrow Design Centre was the perfect venue for running this course and making it such a success." Getting stuck in with procion dyes. 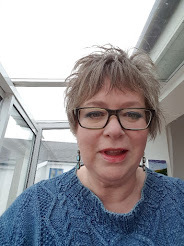 "I had been looking for a creative textile course for about 2 years;a course that was pitched somewhere between a leisure evening class and a degree, that would also be suitable for someone with no textile experience or portfolio! A tall order but I found exactly what I wanted at IDC so a big THANK YOU to you and of course Kim. It has challenged me in more ways than I could have imagined and is now a foundation on which I will find my own creative voice in the future"
There is still time enrol on the course - which starts in 3 weeks. We have reduced the price of the course from £1700 to £1500 as several teachers were trying to get the course as part as their CPD (Continuous Professional Development). We hope they can now enrol. All the information about the nine two day workshops (no they can't be booked individually - it's a long course) and the course description can be found here - www.experimentaltextiles.com there is also a short video on this site of me talking about the course, filmed on my stand at one of the shows. I am off to Art Van Go on Monday to get ready to teach Creating Original Designs on Tuesday and Wednesday, I am very excited about seeing the AVG team again. While I am up there I will also be meeting some members of a group I may be mentoring. Ooooerr!!! Hello Jill, Diana and Todd - I didn't make those calls - but I will.